When I was a pre-teen, my dad was able to explain these "gross" red round structures I saw on goat and cow placentae in a very easy to understand way. He called them "buttons." He explained that these "buttons" on the "placenta" snapped onto the uterus to stabilize the placenta in the uterus and to allow food to pass from the mother to the growing embryo. When I was older and received a more "scientific" explanation for these placental structures, I was amazed how accurate his "simple" explanation is. A more scientific explanation follows the definitions. Cotyledon - Cot`y*le"don, n. [Gr. a cup shaped hollow, fr. . See Cotyle.] (Anatomy) -One of the patches of villi found in some forms of placenta. The cotyledon is the structure on the fetal side of the placentae. Cotyledonary placenta - A type of chorioallantoic placenta in which the villi are grouped into tufts or balls separated by regions of smooth chorion. In 1604, Fabricius introduced a placental classification scheme based upon the macroscopic structure of the sites where attachment occurs between the embryo and the endometrium of the uterus. He listed four main placental types. These are now referred to as the diffuse, cotyledonary, zonary, and discoidal placentas. Ruminants have a cotyledonary placenta. Instead of having a single large area of contact between maternal and fetal vascular systems, these animals have numerous smaller placentae. Caruncles are oval or round thickenings in the uterine mucosa resulting from proliferation of subepithelial connective tissue. Caruncles are readily visible in the non-pregnant uterus. Further, they are the only site in the uterus to form attachments with fetal membranes. Patches of chorioallantoic membrane become cotyledons by developing villi that extend into crypts in the caruncular epithelium. 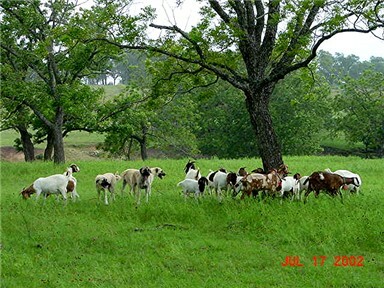 Pregnant sheep, goats and cattle have between 75 and 125 placentomes. Deer also have a cotyledonary placenta, but only 4 to 6 placentomes which are correspondingly larger. During parturition, there is substantial loosening of the cotyledonary villi from caruncles, and the placentomes expand laterally. After expulsion of the fetus and loss of fetal circulation to the cotyledons, capillaries within the villi collapse, leading to a decrease in their size. The uterus contracts and the caruncular stock shrinks, further enhancing the separation of cotyledons from caruncles. In the normal case, fetal membranes with cotyledons are delivered within 12 hours of birth. There is no significant loss of maternal tissue, and therefore, ruminant placentation is considered non-deciduate.